CHUCK BERRY, MR. ROCK'N'ROLL, TURNS 84 TODAY! Morten Reff's The Chuck Berry International Directory, has won the 2010 Association for Recorded Sound Collections Award for Excellence in Historical Recorded Sound Research in Blues, R&B, and Soul – Discography. Begun in 1991, the awards are presented to authors and publishers of books, articles, liner notes, and monographs, to recognize outstanding published research in the field of recorded sound. In giving these awards, ARSC recognizes outstanding contributions, encourages high standards, and promotes awareness of superior works. Two awards may presented annually in each category—one for best history and one for best discography. Certificates of Merit are presented to runners-up of exceptionally high quality. The 2010 Awards for Excellence honor works published in 2009. 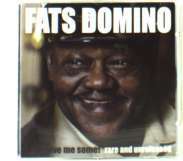 New Fats Domino CD "Give Me Some! Rare And Unreleased"